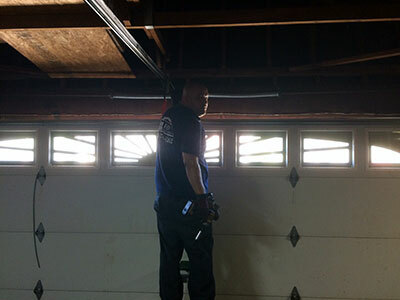 One of the first steps for proper garage door maintenance is checking the condition of the bottom seal and the other weather strips. This involves closing the door fully and turning off the lights inside the garage. If there is light coming through the bottom, sides and top, the strips have to be replaced with new ones. The vinyl weather seals are an excellent choice because they provide reliable protection from water and dust while being highly resistant to damage including UV damage. There are different bottom seal installation options, but the best one involves attaching the item to an aluminum retainer. The seal’s width has to match the width of the door in order to get the best protection. All hardware parts including the rail require careful inspection. The trolley is at the highest risk of wearing and breaking so it deserves the closest attention. The force should be tested with the help of a solid object which doesn’t block the safety sensors. When closing, the door should reverse upon touching it. If the door hits the object, the force should be reduced. The test for the sensors is similar. The difference is that the object underneath the opened door should block the infrared beam. In this case, the door must stay in place instead of closing when the remote control’s button is hit. The steel rod sitting inside the rail requires lubrication. It should be cleaned with mild solvent first, if needed. Special lubricant for openers is the best choice.